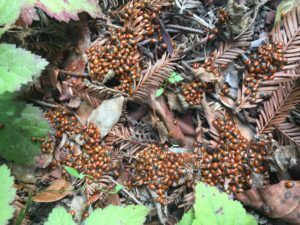 Thousands of ladybugs descend upon Redwood Regional Park in the Oakland Hills in winter. 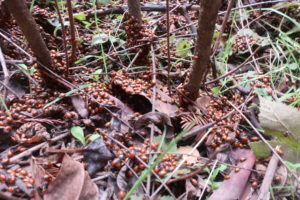 The ladybugs spend their November to February in the warmest, moistest areas. 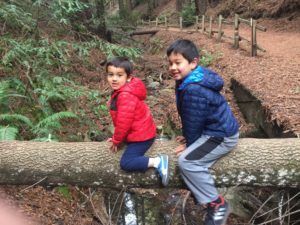 In late December along with a few other families, we hiked ~3 miles roundtrip through the largest redwood stand in the East Bay for the ladybugs. 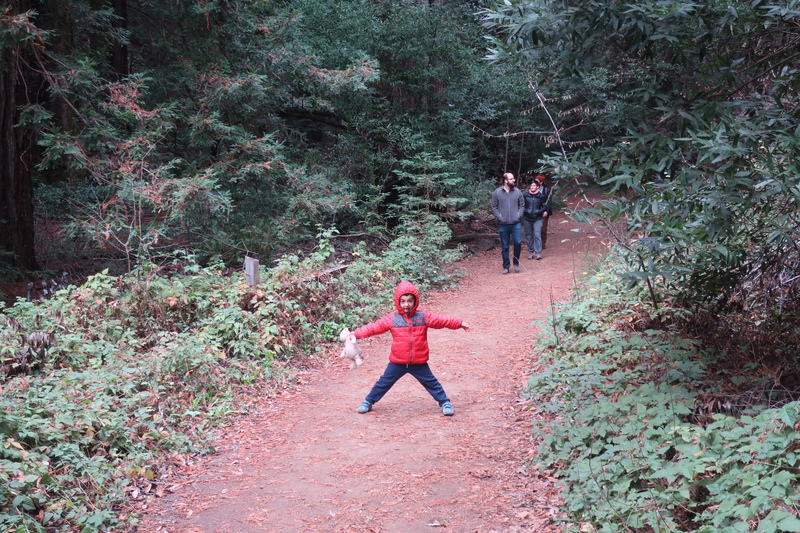 This East Bay Regional Park provides an excellent family hiking adventure. Our destination was the biggest concentration of lady bugs in the park near the juncture of the Stream and Prince trails. Ladybugs are small and surprisingly difficult to spot. Fortunately, the East Bay Regional Parks put a few signs to help hikers. The juncture is ~1.5 miles from the Skyline Gate Staging Area along the Stream Trail. The trail starts in a busy parking lot near many local homes. The trail descends into the canyon and passes a Girl Scout camp. The mixed forest yields to a peaceful Redwood canyon at .7 miles at the Stream Trail & Eucalyptus trail intersection. According to our online research, the first lady bugs wintering spots are just East of the intersection. We enjoyed a snack and watch. The trail descends further into the Redwood Canyon. The trails are wide and well graded with several well placed benches. We stopped near one of the many logs over the Eponymous Stream. The kids scooted, climbed, ran, and jumped across the log over the canyon again and again. We saw several others stopped in front of some signs just past the Stream & Prince trail junction. 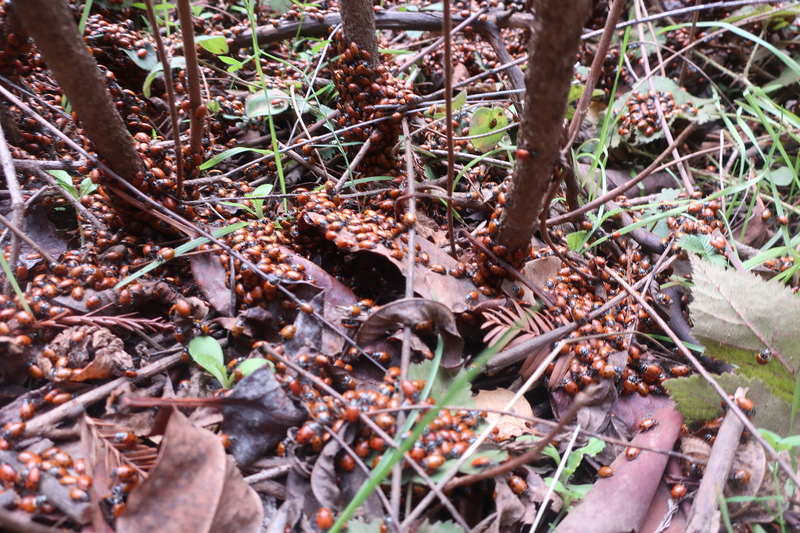 Ladybugs swarmed over trees, signs, and the ground. From afar the hiker just sees a hint of red. Up close the ground comes alive with masses of slowly moving ladybugs. After another snack we turned around and returned to the trailhead. Following fellow hikers dogs provided extra incentives for the boys to hike uphill back to the parking lot. We then enjoyed a late lunch in neighboring Montclair at Daughter Thai Restaruant. Nothing like a good hike and fresh air to make the already excellent food even tastier. For additional information, check out the Ladybug Hotel Page that focuses on shelters and the ladybugs of of Redwood Regional Park.